http://charlotteskitchendiary.com/2012/05/22/beer-battered-lemon-sole-fish-is-the-dish/?replytocom=344911 Steven Tang is best-known for his Chicago-based label, Emphasis Recordings, where he releases house/techno hybrids under several different aliases (including Misguided and Obsolete Music Technology). His latest 12-inch, however, is on Keith Worthy’s Aesthetic Audio, and it fits right in. “Aerial” is aptly named, with airy synthesizer that reminds me of early B12. 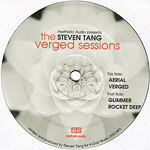 “Verged” begins with an extended tribal beat. Subtle variations tease until a long-held chord joins in halfway through. A simple melody offers release. On the B-side, “Glimmer,” plays with filters over classic Chicago/Detroit sounds. The old-school snares are fantastic. “Rocket Deep,” like “Aerial,” reminds me of old British techno. The interplay between treble synths is perfect as the beat tumbles along. I just wish there was an equally strong bassline. Steven Tang has a way of making new music sound timeless. I wouldn’t be surprised if all of his singles thus far become known as classics.